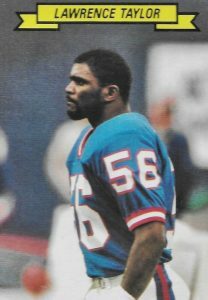 Lawrence Taylor is considered by many to be the best defensive player to have ever played professional football. His quarterback-sacking prowess helped the New York Giants capture two Super Bowl titles, making his cardboard very popular with fans. 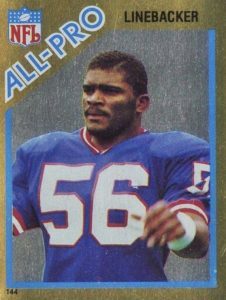 Most important for collectors, the Lawrence Taylor rookie card is one of the key choices from the 1980s. Enjoy some of L.T. 's best football cards from his playing days, including several appearances from the flagship Topps football sets. After dominating offenses at the University of North Carolina, the Giants selected Taylor with the second overall pick in the 1981 draft. Taylor became a perennial Pro Bowler, making ten straight teams. He also helped transform the outside linebacker position into a sacking specialist. On his way to to the Super Bowl XXI title, Taylor became a rare defensive winner of the NFL MVP Award in 1986. Taylor would later add Pro Football Hall of Fame member to his résumé in 1999 after being elected on his first ballot. 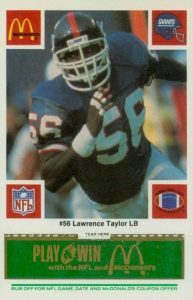 Shop for Lawrence Taylor Autograph Cards on eBay. 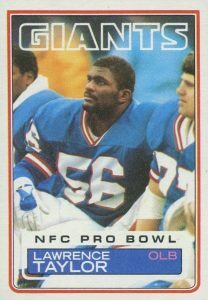 Although his NFL releases are the most popular, these are not the only options for Lawrence Taylor cards. A graduate of UNC, several sets feature autographs with Taylor in his Tar Heels uniform. Look to the 2014 Upper Deck Exquisite Football, 2013-14 Upper Deck Quantum, and 2016 Panini Immaculate to find collegiate appearances. Well known as a golf fanatic, Taylor's non-football cards can be found in 2012 SP Authentic Golf. While the majority of his top cards are documented below, Taylor also had several notable autograph cards with other defensive legends. This includes fellow Giant Michael Strahan in 2015 Donruss Signatures Football and Pittsburgh Steelers legend "Mean" Joe Greene in 2009 SP Signature Edition. 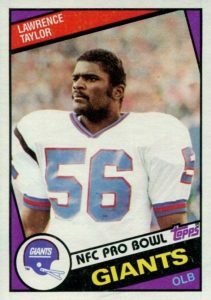 The earliest Lawrence Taylors cards are a bright spot in the sport during the '80s, and some of the most valuable cards available. Focusing on cards from his active career, value is the main component, along with design, for determining placement. 1990 North Carolina Collegiate Collection is a multi-sport product devoted to the stars that attended the Chapel Hill, North Carolina university. 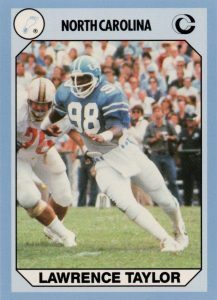 Top cards include appearances by Michael Jordan, James Worthy, and Taylor, whose card features him rounding the corner of the offensive line on his way to a likely sack. In his senior season, he recorded 16 sacks and was named the ACC Player of the Year. The black-bordered 1985 Topps design features a horizontal card for Taylor. Completist collectors will also want to track down a red parallel found on the bottom of '85 Topps wax boxes. In total, there are 16 box bottom cards to collect from the set. Building on his strong 1985 season, '86 saw him become the second defensive player to ever win the NFL MVP award, the other being Alan Page from the Minnesota Vikings. 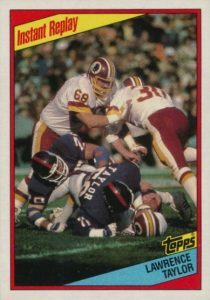 Along with Taylor's stern look on the main 1984 Topps card, an Instant Replay subset shows him tackling a Washington Redskins runner for a loss. His reputation as one of the toughest players in the NFL was solidified during a 1985 game against the Redskins in which he severely injured quarterback Joe Theismann during a sack, ending Theismann's career. Topps inserted several examples of Topps Stickers into packs of 1982 Topps and each smaller-sized sticker included a reverse side that read "Coming Soon." In total, 16 stickers were included with Joe Montana and Taylor's gold-bordered sticker being the highlight of the insert line. The cards are numbered using the regular sticker checklist so that they could be placed in the correct position in the 1982 album. Taylor was featured on two different McDonald's scratch-off cards during the 1986 season. One came from the New York Giants team set and the other was part of an All-Star collection for top NFL players. Both cards are nearly identical except for a McDonald's All-Star Team logo positioned between the NFL and Players' Association logos. Each version has four different parallels of blue, black, gold, and green, and it is the Giants team card which holds more value with collectors. 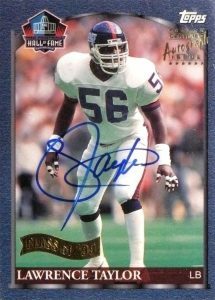 One of the first Lawrence Taylor autograph appearances came in 1999 Topps Hall of Fame, which, as the name implies, honors L.T. 's HOF selection. Some critics had wondered if Taylor's legal problems during and after his playing career would limit his chances at Canton but he was a first-ballot inductee. The 1983 Topps Sticker set came packed in boxes of 35 stickers and every box displayed two cards on the bottom of the packaging that could be hand-cut. Each box featured an offensive and defensive player with a total of 24 cards available. As seen below, the clean and simple design is just Taylor's name on a yellow ribbon running above the photo. Other defensive stars in the set include Ed "Too Tall" Jones and Mark Gastineau. On the 1983 Topps card, Taylor takes a seat on the bench with his Giants defensive teammates collectively known as the "Big Blue Wrecking Crew." Taylor and fellow Hall of Fame member Harry Carson were the on-field leaders, and the squad was coached by Defensive Coordinator Bill Belichick, who later became the head coach of the New England Patriots. 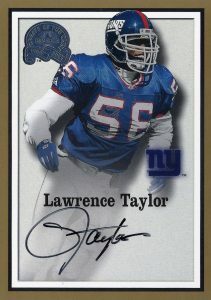 Although it's not the first Lawrence Taylor autograph card, the signed 2000 Fleer Greats of the Game card stands apart. This is due to its beautiful design and use of white space which allows the autograph to be featured front and center. Taylor's signature is memorable in that he typically only signs as "Taylor" and rarely includes "Lawrence." The signature is dominated by the oversized "T" which features a large loop at the start of the letter. The 1982 Topps design bears a striking resemblance to 1975 Topps as both featured a flag and team logo at the base of card. 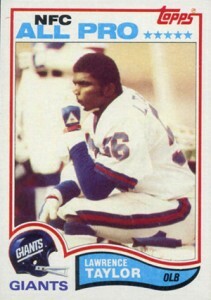 The popular Lawrence Taylor rookie card shows the young stud with his hand on his chin as if he might be contemplating his next move to get to the quarterback. Taylor would win both the Defensive Rookie of the Year and Defensive Player of the Year his rookie season, setting the stage for a remarkable career. Highly graded versions of his 1982 Topps card can reach $900 at auction. LAWRENCE TAYLOR 1991 Tuff Stuff Magazine ERROR Card MISSING PICTURE Front RARE! 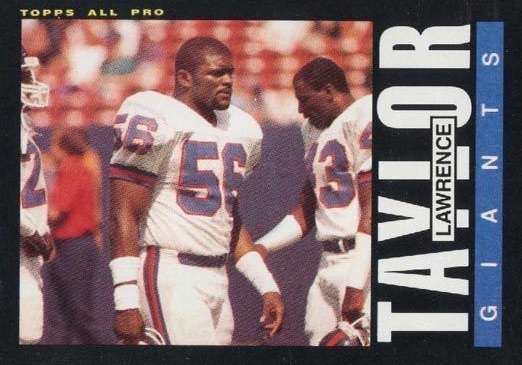 With the 10 Lawrence Taylor cards I thought you may have mentioned the 1991 Pro Set autos which are super rare, I still don’t know if they actually exist as I have never seen a picture of them, do you know anything of these 2 cards?